It is the pioneer and the largest of the four sanctuaries. 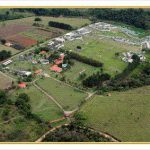 Planned and owned by Dr. Pedro Ynterian, this sanctuary gave a start to the activities of GAP Brazil in 2000. 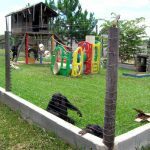 Nowadays it rehomes more than 40 chimpanzees and the structure, which fulfills the best security standards, is prepared to receive more primates who need a new home. The permanent team of the sanctuary is composed of a veterinarian, who is in charge for the medical station, and a biologist, who develops environmental enrichment activities with the “guests”. 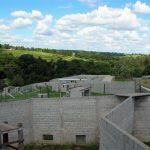 The plans for the expansion of the sanctuary includes the construction of a specific area for social and cultural development of the chimpanzees, which is kindly called “Escolinha” (little school), and a surgical centre, to specialized emergency attendance. Recinto con enriquecimiento ambiental, para ejercícios y socialización. 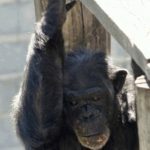 Recintos rodeados de muros, garantizan la seguridad de los chimpancés y de las personas. Male, 27 years old (2011). He was born at Sorocaba zoo, but lived and worked in a circus for a long time in Brazil. Aiming that he could stay for a longer period in the circus, he had all his teeth pulled out when he was young. At the circus he was obliged to do exercises and for that he has an athletic appearance until nowadays. He understands Spanish and Portuguese. He likes sweets, liquid food, coconut and corn, even though he has no teeth. He is friendly when is presented to someone and he enjoys very much human contact. He loves to do grooming and likes very much to run in biped position when cars pass near his enclosure. Today he lives with Carolina and they get on very well together. They respect each other and live together in harmony. Male, 15 years old (2008). He arrived at the sanctuary in 2004, coming from a circus. He was born in an extinct Chimpanzee breeding place in Morrete, Paraná, from where the circus bought him when he was some-months old. He is very intelligent, friendly with whom he knows and he enjoys human contact. He loves to look himself at the mirror, investigating his eyes, mouth and nose. Still, Billy feels like a baby and spends part of his time sucking his finger. Due to past traumas, Billy is under homeopathic treatment. He has already shared the enclosure with Quennie, Frances, Tião and Bruna, but he never got along well with them. So he ended up living alone and communicates a lot with his neighbors through the windows. He likes very much his neighbor Simon. It is easy to see that they are allied. But he does not like Caco, who is Simon’s enemy. Recently he has moved to a big enclosure built for him near the internal road of the sanctuary. The enclosure has a bedroom and a dinning room with table and banks, which he uses to eat, watch TV and draw. The walls have paintings that he likes a lot. Male, 8 years old (2011). He arrived at the sanctuary in 2003, when he was a little bit more than six months old. He was born in Bauru (São Paulo estate), was abandoned by his mother and was transferred to Brasilia zoo. He is brother of Carolina Jr and just like her, is hipper-active, easygoing, intelligent and very kind. He is very playful and is courageous. He punches his chest with his hands like a gorilla, to call for attention. Today he lives in Guga’s group and gets on well with everyone. As he is the smallest one in the group, he is protected and cared by Guga. Male, 15 years old (2011). He arrived at the sanctuary in 2005, coming from Portugal. He is from Luanda, Angola. He lived for four years in Badoca Safari Park, 150km from Lisbon, which used to be responsible for him after an agreement with Angola Government. After that his guardianship was transferred to GAP sanctuary in Brazil. He has a very good personality, is euphoric and looks for contact with humans. He smiles and yells of joy every time he is given a present. Today he is alone in his enclosure, for he had not adapted to the company of some others he used to be put together with. His current enclosure has trees and a pool. He has already lived with Tuca, Bruna and Carioca, but he did not adapt well. The attempt of putting him together with Monica did not work out, because he attacked her. Female, 21 years old (2008). Like Carioca, she arrived at the sanctuary in 2004, coming from ex-Garcia circus, where he lived for a long time confined in a small cage. Because of that, she is traumatized with closed spaces and she hardly enters in rooms or in dinning rooms, spending most of her time in the top of the platforms or in the tunnels. She is a quiet and calm chimpanzee and loves to feel the sun in the platform covered with a fabric. She lives very well with Carioca and Tuca, who are always beside her. Male, 24 years old (2008). He was raised as a human by a family until he was 12. 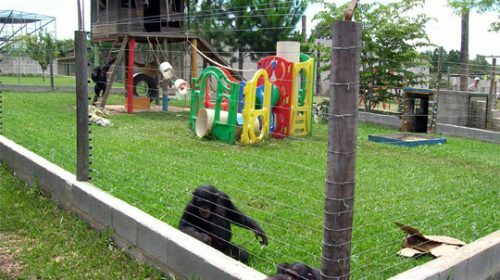 After several runaways, they decided to donate him to Curitiba zoo, which after a while transferred him to Sorocaba zoo, where he stayed isolated in a small enclosure for 6 years. Due to his human raise followed by isolation, Caco developed an auto mutilation syndrome, to call other’s attention, which results in deep wounds. He has already been submitted to treatment with tranquilizers, but he got worse in the end of year 2001. Everything that has been done at the zoo to solve his crisis of auto mutilation did not have any effect. Then Caco was sent to live in the sanctuary, where he had a meaningful improvement. Today Caco does not mutilate himself for a lot of years, but he needs to take small doses of anti-depressive, plus the homeopathic medicine. He lives in peace and calm with his partner July, who supports him when he is in need. He has a very good personality, enjoys to play and to have contact with humans in whom he trusts. Male, 13 years old (2008). He arrived at the sanctuary in 2004, coming from ex-Garcia circus, where he was born and lived for years. He loves to show every little wound so that he gets grooming. He is very strong, agile, very curious and temperamental and because of that he takes long to adapt to new situations. He has already lived with Martin and got along very well with him. Today he lives with Tuca and Bruna and has a special care for both. Male, 8 years old (2008). He has been raised by humans since the beginning of his life. He is Lulu’s son and brother of Claudia, Vitor and Monica. He lives in Guga’s group or with Noel and Tião, with whom he sometimes fights for supremacy, although they are friends. He is very loving with humans, playful, agile and brave. He is not afraid of nobody and intimidates strange people by throwing sand. Female, 6 years old (2008). Sister of Billy Jr, she came from Bauru zoo, where she was born. She also had a brief time in Brasilia zoo. She is hipper-active, very loving and has a strong personality. She likes very much to put socks and plays with hair elastics that she puts on her legs and arms. Today she lives in Guga’s group and always walks in the opened enclosures rolled up in a blanket. She was the last female chimpanzee that worked in circus in Brazil. She arrived on 2009, as a result of an consfiscation operation taken by Ibama and Federal Police in a circus in Minas Gerais state. The circus was using her for more than 30 years, not only on the performances, but also in parties and visits to schools. She must be more than 40 years old, is very small and always lived with humans. 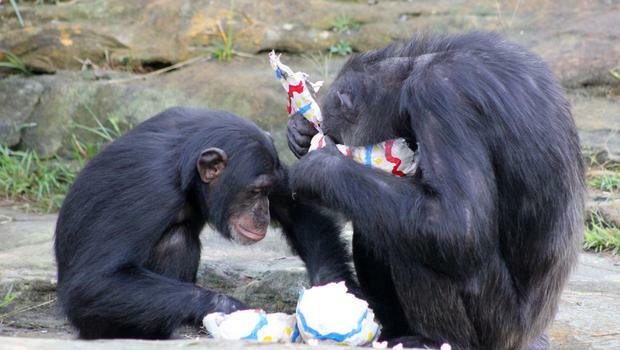 She is getting used to sanctuary and to life wih other chimpanzee. Male, 23 years old (2011). He arrived at the sanctuary in 2005, after a request of Ribeirão Preto zoo. 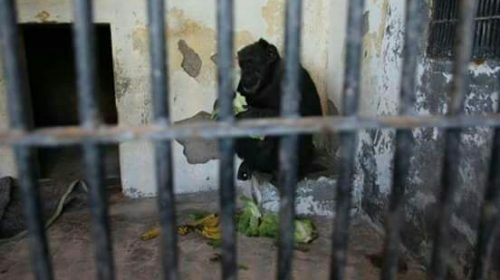 The zoo wanted that Charles lived in better conditions and had the opportunity of having contact with others chimpanzees. Charles arrived in Brazil when he was 8 years old. He was born in a zoo in Lisbon and his parents are from Angola. He has traumas with unknown people, becoming very upset. In these situations he can do some auto-mutilation in his arms, a habit that he developed in the zoo when people get very near his small enclosure. In normal conditions, with no one strange around, Charles has a very good personality, and is delicate, playful and no aggressive. He also is one of the biggest chimpanzees of the sanctuary. Today he is alone in his enclosure, because in 2006 he was living with Quennie and Frances and had a disagreement with them, attacking Quennie quite seriously. He has a window from where he can communicate with them. He is son of Gilberto and Lulu and brother, by mother, of Carlos, Vitor and Monica. He arrived at the sanctuary when he was a baby. Today he is 10 years old (2011) and is very active and intelligent. He is very happy, loves play running and counts till five, doing sounds as he could say the numbers. He lives in Guga’s group and gets along well with everyone, mainly Emilio, with whom he plays running for several hours. He hates photo cameras and throws sand and spits continuously at the persons he does not know. Female, around 23 years old (2008). 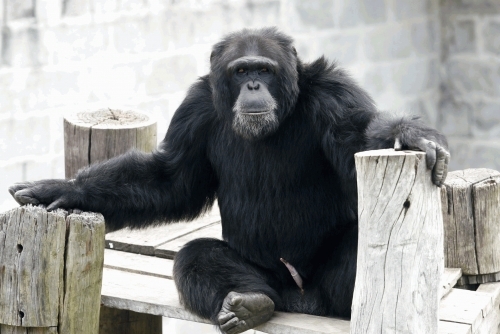 She arrived at the sanctuary in 2001, coming from an extinct Chimpanzee breeding place in Morrete, Paraná. She is very strong and agile, although her small size. She is mother of Dolores, Samantha and Luiza, this last one the unique daughter Ditty was able to raise. She lives in Gilberto’s group, who loves her. Recently (2008) she had other baby with Gilberto, whose name is Pedrinho. She is raising him together with his father, aunts and her daughter Luiza, who helps her to take care of the baby. Female, 11 years old (2008). She used to live in Di Napoli circus and was confiscated by Justice due to mistreating and lack of documentation. She stayed at Beto Carrero World, in Santa Catarina state, for a year, where she almost died and then recovered. 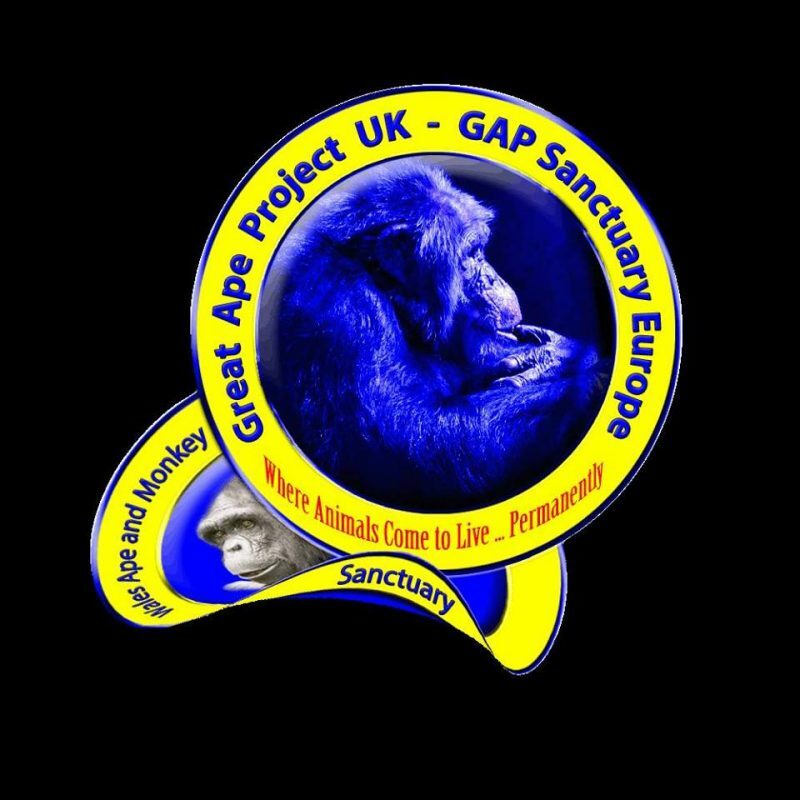 When she arrived at GAP sanctuary in 2005 she had yet respiratory problems and nutritional deficiency. After quarantine she was put together with her sister Samantha and with Noel and Guga. Dolores is very agitated and is always opened to play with her partners. However, she is not very friendly with humans, probably due to her memories of the past. Today she lives in Guga’s group and in the period she lived with Billy Jr. she considered him as her son, spending a lot of time playing with him. Guga is fond of her. Male, 10 years old (2011). He was also raised by humans since his first days of life. He is son of Gilberto and Margarethe and is the youngest brother of Noel. 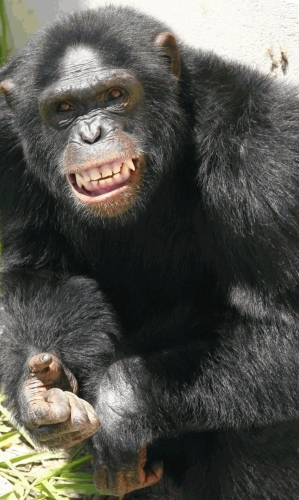 He is called as the “smile” chimpanzee, because when he sees humans who he knows he exhibits a beautiful smile. He lives in Guga’s group and he likes very much to play with Claudio. He is very loving, intelligent and likes very much to play with humans so they tickle him. Emilio is allied to Guga and is the second leader of the group. Female, she is more than 50 years old (2008). 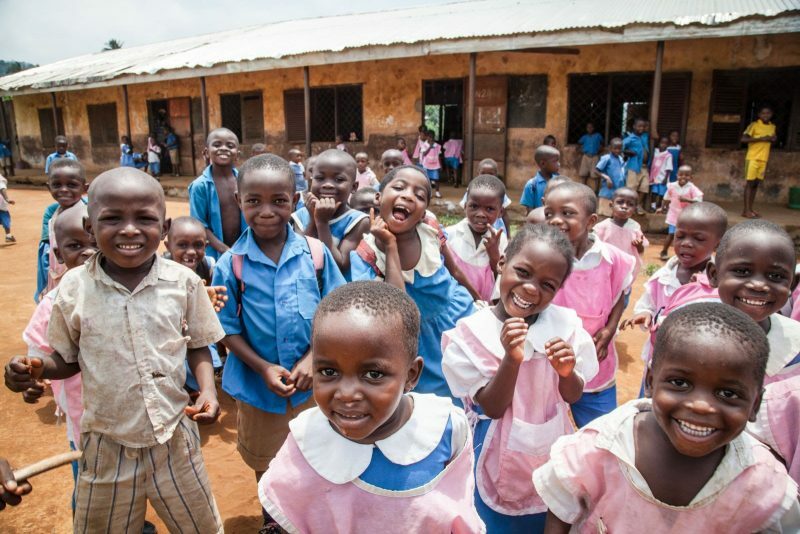 She was born in Africa, but was taken to United Status when she was a baby. It is suspected that she lived in medical experiences laboratories when she was young. When she was already an adult she lived in a zoo in Colorado. From this place she was sent, together with Quennie, to Vesty Pakos zoo, in La Paz, Bolivia. 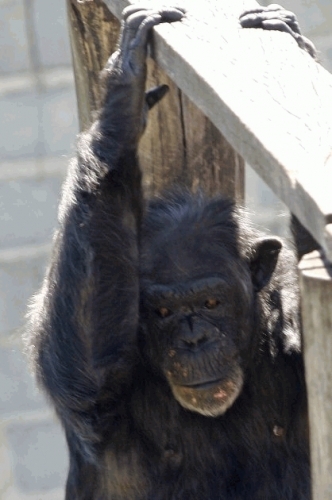 She arrived at GAP sanctuary in 2003 and today, like Quennie, they are the oldest chimpanzees of the sanctuary. She is temperamental, introspective and does not like very much to be in contact with humans. She adapted very well to the sanctuary routine and lives together with Quennie, her inseparable friend. Male, around 25 years old (2008). He came from the extinct Chimpanzee breeding place in Morrete, Paraná. He is very strong and agile and has a good personality. He is not aggressive, as many males can be, but he is not very fond of human contact. As he is surrounded by three adult females, with no other male to have disputes, he is very well adapted. Although he express his preference for Ditty and Margarethe, he respects very much Lulu and his daughter Luiza, playing with her in a kind way. He is also father of Noel and Emilio, among others. In his group the females have an alliance that allows that the male controls the situation until a certain point. After that he needs to negotiate with them. He accepts Pedrinho, his son with Ditty, very well, with whom he already plays. Male, 12 years old (2011). He was rejected by his mother and was raised by humans. He was the inspiration for GAP Project in Brazil and was the first one to arrive at the sanctuary in 2000, coming from the extinct Chimpanzee breeding place in Morrete, Paraná. He is very active, good, playful, sociable, jealous, intelligent and very connected with his human family. 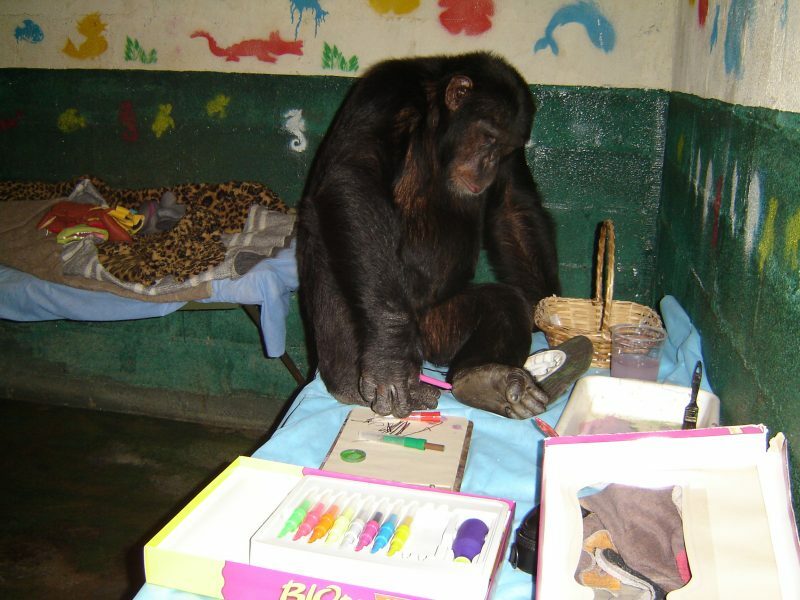 Today he lives in a group with other chimpanzees (Emilio, Dolores, Samantha, Carlos, Claudio, Carolina Jr. and Billy Jr.). Guga is the oldest male and, as a consequence, he is the alpha male. But there are moments that he disputes power with Carlos (who sometimes lives together with Noel and Tião), with whom he has an alliance that allows them to always have the group’s command. Male, 20 years old (2008). He arrived at the sanctuary in 2003. He spent most time of his life in a circus in Minas Gerais state and used to travel through the countryside of Brazil. He is castrated and had all his teeth pulled out. Jango is very calm (due to the castration), kind and he enjoys playing and running. He lived for three years with Gil, until his unexpectedly death, which he felt a lot, as long as they liked each other very much and lived together very well. Today he lives with Junior, for whom he developed a lot of affection. They play a lot running and when Junior is afraid, Jango quickly hugs and comfort him. He likes very much macaroni with tomato and meat sauce, which he eats in a plate with a spoon. Male, 21 years old (2011). He arrived at the sanctuary in 2008, when Ibama confiscated all the animals of Le Cirque circus, in Brasília. He is castrated and all his teeth were pulled out in the circus. He had a heavy chain in his neck when he arrived, which resulted in deep scars. He is already adapted to the sanctuary. He always wants to thank for the things given to him and wishes to hug and kiss all the humans who saved him of his past miserable life. Male, 17 years old (2008). He arrived at the sanctuary in 2005, coming from a zoo in Curitiba, where he lived for four years and did not adapt very well. His first owners, a family from São Paulo state that raised him at home for ten years in a 9 square-meters cage, had sent him to Curitiba because he became very strong and they were afraid he could escape. 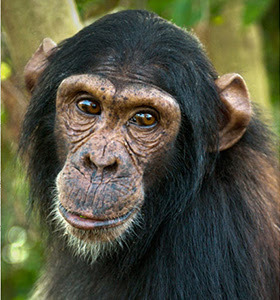 Johnny is much humanized and is not interested for other chimpanzees. But slowly he is loosing the fear he feels of them. According to the seller who gave him to the family, he had come from Switzerland when he was two years old. He does not have the fingers of his right hand and no one knows how he had lost them. Johnny is very happy, playful and loves to stay at the top of his platform, under his blanket and fabrics, no matter it is sunny or it is rainy. He also enjoys the contact with humans he knows and likes to play run and catch in the tunnel that links his two enclosures, which demonstrates he is very well adapted to the sanctuary. Female, around 16 years old (2008). She came from Piracicaba zoo, in São Paulo state, which was temporarily closed. She used to live in a circus in northeast of Brazil. She had been bought by an animal dealer, who did not have the proper documentation and ended up delivering her to the zoo. Jully lives with Caco and helped him to overcome his depression crisis that resulted in auto mutilation in his legs. She has a strong personality, is jealous but very calm. He loves soft drinks and enjoys that humans greet her by kissing repeatedly her hand. Male, around 33 years old (2008). He arrived at the sanctuary in 2005, coming from a zoo in Brasilia. He is very kind, calm and loves to do grooming and drink milk, his favorite beverage. He has already lived with Gil, but it did not work out because he was afraid of her. Today he is Jango’s friend and the two live together. They play a lot and they protect each other when one is afraid of something. Junior used to be addicted to cigarettes, because he learned to smoke in the circus where he lived for many years. We had to pull out many teeth that were in dreadful condition. Male, 37 years old. He arrived on 2009 and came from a zoo located in the countryside of São Paulo, where he lived for years. 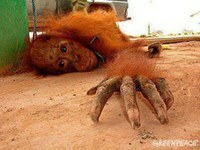 Lilico has a famous story: a few years ago he escaped from the zoo and could not be found for a long period of time. In the evening the zoo received a call about a strange being that was in a bar in the neighborhood. A team of the zoo went there and found Lilico sitted on a table together with a lot of drunk people and he was also drinking a lot. He did not want to leave the bar, so they gave him more “cachaça” until he became completely drunk to be taken out of there. Female, 5 years old (2008). She was born in the sanctuary in 2003. Her mother is Ditty and her father, Gilberto. 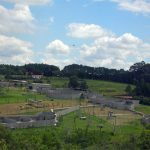 During the first years Luiza lived with her mother in a separate enclosure that had communication, through windows, with the main enclosure, where lived her father and aunts. She is very active, agile, intelligent and curious. Today Luiza already lives integrated in the group of her father and aunts and gets along very well with everyone. She plays all the times mainly with Lulu. Since she had been integrated, the group is more alive and got a better mood, as long as she represents fun for everyone. She loves to play running and call the others holding her hand out to the enclosure. She is also very fond of provoking her aunts, getting their food and putting it far from them. Male, adult, 17 years old (2011). 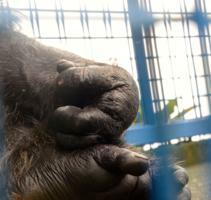 He was born at Goiania zoo and was taken off his mother, Tata, a few days alter his birth. Then he was sold to a circus. He lived several years of his life in Estoril circus and had relationships problems with humans. He had behavior problems when he arrived at the sanctuary and those were completely treated later. He is very active, playful, and intelligent and knows how to count until 10. He is also very fond of running, playing run and catch, drawing and brushing his teeth. He spends most of his time in his 7000 square meters enclosure, where he is able to see everything that is happening in the sanctuary. He has already lived with Carolina and does not accept any other male chimpanzee, reacting in a violent way. With humans, especially women, he has a good relationship. He likes kissing and undoing shoelaces. He is the guardian of the sanctuary and follows the routine of every employees and workers, as he knows all of them. Male, 9-month old (2008). He was born at the sanctuary and is son of Peter and Tatá, who had arrived at the sanctuary already pregnant. He receives total attention and dedication from his mother. Although he already tries to take his first steps and separate from his mother, Tatá is always alert and carries him whenever she senses danger. Judy helps Marcelino’s mother and the father, Peter, is already starting to play with him. 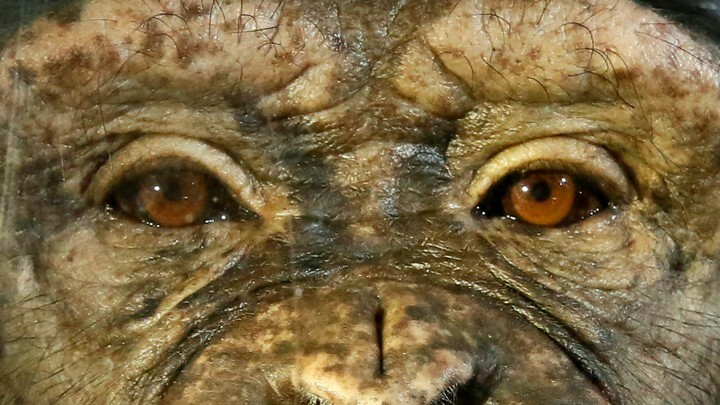 Female, around 40 years old (2008), she came from the extinct Chimpanzee breeding place in Morrete, Paraná. She does not have any teeth, because all of them were pulled out in a circus when she was young, to make the work easier. She is the mother of Noel and Emilio, but she does not have this idea as long they were taken off her when they were a few days born. She is very docile, calm and kind and in spite of all the traumas she had suffered, she does not reject humans. She loves to do a big nest at night, to sleep in the darkest corner of the room, putting the maximum of fabrics and blankets together. She likes very much to sunbathe in the morning on the platform, and also gets wet in the rain rolled up in a fabric. Male, 12 years old (2008). He arrived at the sanctuary in 2004, coming from the extinct Garcia circus. 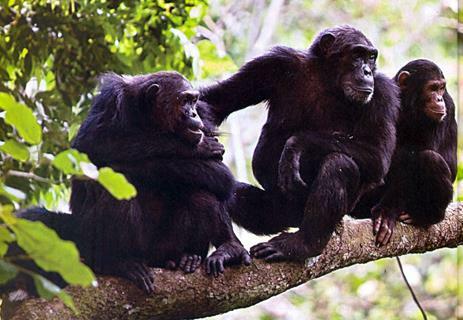 He is very kind, docile and happy and has relationships with humans in easily, just like with other chimpanzees. He has already lived with Leo, Noel, Samantha, Tião and Carioca, with whom he gets along very well, for both are very alike and have the same tastes. Today he lives with Monica, with whom he has a very good relationship. Female, 12 years old (2008). She arrived at the sanctuary in 2006. She is daughter of Lulu and Flint, and is sister of Carlos and Vitor. 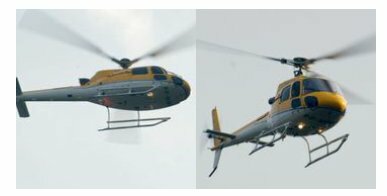 She looks like very much with her brothers. She lived all her life in a circus, where she had been spoiled and humanized. In the beginning she would only accepted food given in her mouth or prepared specially to her. Today she is more independent. She is very beautiful, with an outstanding body position, agile, happy and active. She likes very much to wear clothes and many times she does a kind of skirt with fabrics, and walk in the enclosures. After several approximation practices, we put her together with Leo, with whom she had lived very well until his death. We have tried with Bongo, but they had quarrels. Nowadays she lives with Martin, who hugs and kisses her frequently. Female, around 30 years old (2008). She arrived at the sanctuary in 2007, coming from extinct Garcia circus, where she had a lot of babies who are with us nowadays. She is small and is completely black. She is quick and agile and very delicate and looks for contact with humans. Male, 10 years old (2008). He had been raised by humans since his birth and arrived at the sanctuary in 2000, together with Samantha. He is Gilberto’s son and is the eldest brother of Emilio. He is very agile, dominant, observant and very intelligent. He cries and yells when his will is not attended. He does not like unknown people and throws any object he has on his hands towards a strange (and he has an excellent shot). Today he lives together with Tião and sometimes Carlos gets together with them. He has already lived with Martin. He lived with Samantha during all his “babyhood”. Male, almost one year old (2008). He is Ditty’s and Gilberto’s son. He lives with his parents, his sister Luiza and his aunts Margarethe and Lulu. He already releases himself from his mother, walks a little bit by his own and plays with his father and sister. Male, around 22 years old (2008). 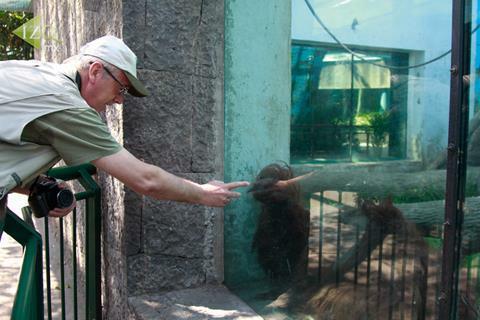 He arrived at the sanctuary in 2007 and arrived from a particular zoo. Peter is a very strong chimpanzee, handsome and is the whitest chimpanzee that lives in the sanctuary. He likes to play run and catch and has a voracious hunger, probably because of the lack of food faced in his experiences in both zoos. He is the father of all the children that the females Judy and Tatá had given birth on their lives: Victoria, Debbie, Meggy and now Marcelino, and other one who died in the attempt of taking him off the mother. He came from a zoo in Germany. Male, 17 years old (2008). He arrived at the sanctuary in 2004, together with Simon (Sam). He was born at a zoo in Belgium, from where he had been taken to live together with Simon in a zoo in Amsterdam. They have a very strong bond, like brothers. In the zoo he had been assaulted by a main group of chimpanzees and almost died. He was separated and isolated for two years, while he recuperated. He is calm and is very fond of contact with humans. He sends kisses when he wants rapprochement. He is very afraid of open environments, like the area with the fences, and because of that he prefers tunnels and closed enclosures, where he feels safe. Apart from the traumas he had suffered, he is already very well adapted to the life in the sanctuary, and lives calmly with Simon. Female, 9 years old (2008). She had been raised by humans since the first days of her life and arrived at the sanctuary in 2000, together with Noel. She is very agile, smart and observant. She is introspective and does not show her feelings, but she is kind and is always seeking for attention. When she was a baby she lived for many years with Noel and today she is in Guga’s group. She is Guga’s official girlfriend. She gets along well with her sister Dolores, with whom she prefers to sleep during the night. Male, 16 years old (2008). 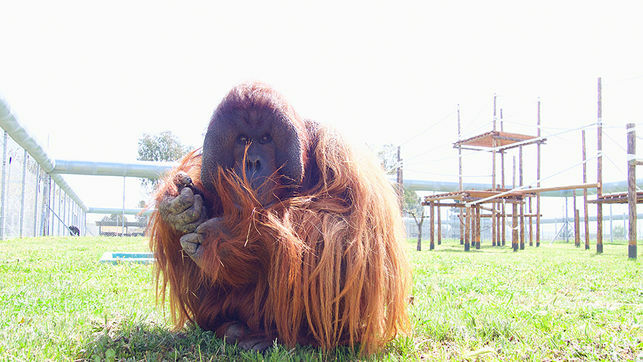 He arrived at the sanctuary in 2004, together with Rakker. He was born in Artis zoo, in Amsterdam, Netherlands, where he and Rakker had been raised. 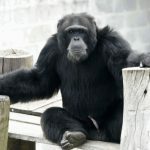 He was integrated to a group of eight chimpanzees in the zoo, together with Rakker, and after a while, trying to control the leadership with the alpha male, he had been assaulted by him, but not seriously. Rakker, on the other hand, was attacked and almost died. He is a little bit agitated, suspicious and very temperamental. He loves to play running when he is in good mood. Today he lives with Rakker, who is his great partner. Female, she was born on April 28th 2009 at the sanctuary (2 years old – 2011). She is daughter of Samanta (10 years old) and Guga (10 years old). Her mother did not know how to take care of her, as long as she is very young, is an orphan and never had the chance to see a pregnant adult female. We decided to take her out of the enclore and we are raising her. Sofia is taken to see her parents every day, so that in the future she can be introduced in her original group. Female, around 27 years old (2008). She arrived at the sanctuary in 2007 and arrived from a particular zoo. She arrived at the sanctuary very weak and pregnant and was able to give birth to a healthy baby, Marcelino. When she arrived she dragged and hardly could walk. She had a strong thirst and drank a lot of water and ate everything with great anxiety. Now she is calmer and is taking care of her son, the first male she had given birth to. She is reserved and calm and has a very good personality. We suppose she had come from Switzerland, but it is possible that she had been born in Africa and had been caught in the wild. Male, 12 years old (2008). He arrived at the sanctuary in 2004, coming from a circus. He is playful and enjoys to jump and to run. He demonstrates happiness when he sees humans he likes. He is very big and beautiful and loves to eat. In spite of his great size, he is not that brave and gets scared easily. He lies down on the ground opening his legs and arms when he is afraid of something. He has already lived with Martin, Carioca and Billy, with whom he had already lived in the circus. Today he lives with Noel and Carlos. He likes soccer ball and knows how to play with it. Female, 40 years old (2008). She came from a circus where she must have suffered a lot. Her body is covered by scars. She does not have any teeth – all of them were pulled out in the circus to avoid bites and to make it easy to use her – but she is very gentle and docile. She likes very much the contact with humans and always greets us with a kiss and sounds of joy. She loves to play with clothes and bottons, tying and untying them. Today she lives with Carioca and Bruna, who is her greatest friend. As long as she does not have any tooth, she scrapes the most solid food with the nails. She is a living symbol of the suffering that a lot of chimpanzees face in circus to entertain humans. Male, 21 years old (2011). He arrived in 2008 together with Jeber, when Ibama confiscated all the animals from Le Cirque circus in Brasilia. He is agitated and in the beginning it was a little bit more difficult to relate with him. But in a few months he was already docile and tender, like Jeber. He is castrated and has no teeth. Like Jeber, he came to Brazil from Switzerland when he was young and was sold to Le Cirque. He always wants to please the keepers and provokes the females Frances and Quennie, who live in front of them. He is very grateful for the change in his life, after the miserable reality that he lived.